Mothers from problem families should ‘feel ashamed.’ They are damaging society and should stop getting pregnant, according to a senior government advisor. Louise Casey, the Prime Minister’s troubled families’ tsar, has said it is time for the state to intervene. With overpopulation becoming a problem the UK government are proposing a new bill. Every girl of school leaving age who has no guaranteed job prospects or further education plans will be forced into sterilisation. Tia sees the horror in this, despite not being one of those it will affect, and knows it must be stopped. How is she meant to stop it when the government are closing in on her demonstration activities, even though she remains an anonymous planner, and when its her own father pushing the bill that will see the law passed? Its time for the young to riot, no matter what problems it will cause. Sarah Mussi blew my mind away when I read her previous novel Siege, a terrifying look at exactly how far the very real education bills could take our schools. Now she returns with a novel that will have you thinking about what comes after the bedroom tax… no matter if your family are safe from it now. Riot is a fantastic novel which will have you on the edge of your seat and praying that things don’t develop in the real world to the point they do in Tia’s. The story is fantastic but worrying. I’m not sure how much of its horror will come across to younger readers because I know I wouldn’t have understood the relevance of it when I was a teenager as much as I do now. I was blissfully ignorant of the governments ridiculous notions of things when I was that age and now I am not. I don’t pretend to understand a lot of what goes on in parliament but I have my feelings towards some of it and lets just say if things carry on the way they are doing Riot’s storyline is not completely unbelievable. It was scary just how much this story got to me, with the politicians moulding actions and events so that people believe what they want them to and just how much they monitored the characters lives. Tia was a bit of an odd character, I wasn’t sure quite why she was the way she was. She had seen horrible things and had been brought up with an abusive, emotionally manipulative father, but she was incredibly smart and could have remained ignorant to the things going on. Her relationship with Lacey was one of the things I thought may have stirred up her desire to fight but even that was never explained – how they knew one another or came to be friends was a mystery throughout – and Im not even sure that was the reasoning behind her actions. No matter what the reasoning was though I liked her as a character, and loved that she was the brains behind some of the goings on – especially with Darknet7 – but I wished she didn’t need saving as much as she did. The male main character was a decent enough guy with a bit of a bad boy vibe going on and I would have loved him more if the saving wasn’t going on – to be honest it was a bit stalker-y how he always turned up.. I loved the whole conspiracy idea and how the story developed, the twists and turns it made to get to its conclusion were fantastic and I loved how they weren’t always obvious. There were some proper MI6 goings on and I loved that about the book because even though they happened, they didn’t feel cliched or unrealistic in any way. The fighting back of the people was my favourite aspect of the book and just how horrendous those in charge could be really got to me – especially Tia’s father. The only issue with this book was that Tia was a ridiculously strong character throughout but then needed rescuing like a pathetic little schoolgirl. If it wasn’t for that then I would have easily given this book 5 stars and even with that aspect of the book I still would say it needs to be read by every school kid in the country. I think politics should be taught in schools at a younger age than it is currently available to but until that happens we will have to rely on authors like Sarah Mussi to provide a fantastic social commentary in their novels and hope that readers will be moved to find out more about their own governments. 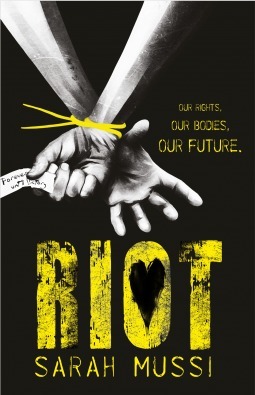 Riot was published by Hodder Children’s Books on May 1st. The publishers provided my copy in exchange for an honest review.